Be the first to share your favorite memory, photo or story of Lyle. This memorial page is dedicated for family, friends and future generations to celebrate the life of their loved one. The world lost a beautiful soul on January 28, 2019. Lyle A. Hart was born on June 28, 1937 to Isaac and Clara Hart in Neenah, Wisconsin. He graduated from Neenah High School in 1955 and pursued higher education at UW Madison. He met Ruth Thelke, the love of his life, and married her on June 25, 1960. They moved to Ames, Iowa where Lyle attended Iowa State University and earned his Doctorate in Veterinary Medicine in 1963. During their time in Iowa they were blessed with two daughters, Jane and Sally. They moved to Black River Falls in 1964 and started Hart Veterinary Service. They were further blessed with their third daughter, Gail, shortly after arriving. He was a loving husband, father, grandfather, great-grandfather, brother, and a friend to many. Lyle loved talking, laughing, and listening to people from all walks of life. Lyle loved caring for animals, his visits with farmers and community members. Lyle is survived by his wife of 58 years, Ruth and three daughters: Jane (Fred) Oyler; Sally (Ken) Uting; and Gail (Darrel) Holmes. He had 10 grandchildren: Philip Thomas, Alyssa (Curtis) Oldham, Beth (Patrick) Nastachowski, Lindsay (Chris) Jazwinski, Ian Oyler, Daniel (Stephanie) Uting, Eric (Amanda) Uting, Lindsey Uting, Alexis Holmes, and Isaac Holmes. He also had two great-grandchildren Blake Oldham and Zoe Uting. He is also survived by his brother, Roydon. He was preceded in death by his parents and his sister, Marian. Visitation and funeral services for Lyle A. Hart will be held at the Black River Falls United Methodist Church on 100 North 4th Street. There will be a visitation on Friday, February 1st from 4-7 PM. The funeral will be at 11 AM on Saturday, February 2nd with a visitation one hour prior to the service. Lunch will follow the service. 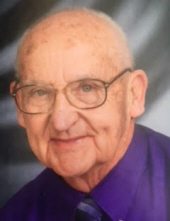 Lyle was passionate about volunteering and if you wish to honor his legacy, memorials may be directed to the Jackson County Food Pantry, the Jackson County Humane Society, or Interfaith Caregivers. To send flowers or a remembrance gift to the family of Lyle Alan Hart, please visit our Tribute Store. "Email Address" would like to share the life celebration of Lyle Alan Hart. Click on the "link" to go to share a favorite memory or leave a condolence message for the family.